When I am, as it were, completely myself, entirely alone, and of good cheer; say traveling in a carriage, or walking after a good meal, or during the night when I cannot sleep; it is on such occasions that my ideas flow best and most abundantly. All this fires my soul, and provided I am not disturbed, my subject enlarges itself, becomes methodized and defined, and the whole, though it be long, stands almost finished and complete in my mind, so that I can survey it, like a fine picture or a beautiful statue, at a glance. Nor do I hear in my imagination the parts successively, but I hear them, as it were, all at once. When I proceed to write down my ideas the committing to paper is done quickly enough, for everything is, as I said before, already finished; and it rarely differs on paper from what it was in my imagination. In other words, Mozart’s greatest symphonies, concertos, and operas came to him complete when he was alone and in a good mood. He needed no tools to compose them. Once he had finished imagining his masterpieces, all he had to do was write them down. This letter has been used to explain creation many times. Parts of it appear in The Mathematician’s Mind, written by Jacques Hadamard in 1945; in Creativity: Selected Readings, edited by Philip Vernon in 1976; in Roger Penrose’s award-winning 1989 book, The Emperor’s New Mind; and it is alluded to in Jonah Lehrer’s 2012 bestseller Imagine. It influenced the poets Pushkin and Goethe and the playwright Peter Shaffer. Directly and indirectly, it helped shape common beliefs about creating. But there is a problem. Mozart did not write this letter. It is a forgery. This was first shown in 1856 by Mozart’s biographer Otto Jahn and has been confirmed by other scholars since. Mozart’s real letters — to his father, to his sister, and to others — reveal his true creative process. He was exceptionally talented, but he did not write by magic. He sketched his compositions, revised them, and sometimes got stuck. He could not work without a piano or harpsichord. He would set work aside and return to it later. He considered theory and craft while writing, and he thought a lot about rhythm, melody, and harmony. Even though his talent and a lifetime of practice made him fast and fluent, his work was exactly that: work. Masterpieces did not come to him complete in uninterrupted streams of imagination, nor without an instrument, nor did he write them down whole and unchanged. The letter is not only forged, it is false. It lives on because it appeals to romantic prejudices about invention. There is a myth about how something new comes to be. Geniuses have dramatic moments of insight where great things and thoughts are born whole. Poems are written in dreams. Symphonies are composed complete. Science is accomplished with eureka shrieks. Businesses are built by magic touch. Something is not, then is. We do not see the road from nothing to new, and maybe we do not want to. Artistry must be misty magic, not sweat and grind. It dulls the luster to think that every elegant equation, beautiful painting, and brilliant machine is born of effort and error, the progeny of false starts and failures, and that each maker is as flawed, small, and mortal as the rest of us. It is seductive to conclude that great innovation is delivered to us by miracle via genius. And so the myth. The myth has shaped how we think about creating for as long as creating has been thought about. In ancient civilizations, people believed that things could be discovered but not created. For them, everything had already been created; they shared the perspective of Carl Sagan’s joke on this topic: “If you want to make an apple pie from scratch, you must first invent the universe.” In the Middle Ages, creation was possible but was reserved for divinity and those with divine inspiration. In the Renaissance, humans were finally thought capable of creation, but they had to be great men — Leonardo, Michelangelo, Botticelli, and the like. As the nineteenth century turned into the twentieth, creating became a subject for philosophical, then psychological investigation. The question being investigated was “How do the great men do it?” and the answer had the residue of medieval divine intervention. A lot of the meat of the myth was added at this time, with the same few anecdotes about epiphanies and genius — including hoaxes like Mozart’s letter — being circulated and recirculated. In 1926, Alfred North Whitehead made a noun from a verb and gave the myth its name: creativity. The creativity myth implies that few people can be creative, that any successful creator will experience dramatic flashes of insight, and that creating is more like magic than work. A rare few have what it takes, and for them it comes easy. Anybody else’s creative efforts are doomed. How to Fly a Horse is about why the myth is wrong. 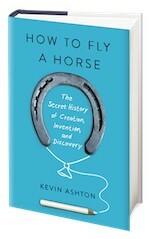 “The Creativity Myth” is excerpted from How to Fly a Horse: The Secret History of Creation, Invention, and Discovery, by Kevin Ashton, available here. If you would like to get news of more posts like this one, please like Kevin’s Facebook page.